Sample Farm Lite is a basic VST Sample Player suitable for all types of simple and easy music making. Sample Farm Lite means perfect integration with any VST compatible application such as Cubase and Logic. It can generate up to 64 voices of polyphony (CPU dependent) at 24 BIT/96Khz quality and it works magically thanks to 32 bit internal processing. What's more, Sample Farm Lite comes with over 600 MB of multisamples, for a total of 75 sound banks…more than enough to cover the most common needs. All the sounds are always available and directly accessible quickly and easily, thanks to Sound Burst's proprietary dynamic link technology. And as if that weren't enough, you can import limitless size, external SoundFont compatible patches in a snap. All the sounds are fully editable in real time thanks to a wide choice of fully automatable parameters. It just doesn't get any better than that! Sample Farm Lite, along with your VST midi sequencer, lets you get right down to music making without any fuss. Sample Farm Lite is available for both Mac and PC. The Mac version has been successfully tested with Steinberg Cubase VST, Cubasis VST and Nuendo as well as with Emagic Logic Audio Gold/Silver/Platinum. The PC version works with Steinberg Cubase VST, Cubasis VST, Nuendo, Emagic Logic Audio Gold/Silver/Platinum, Image-Line FruityLoops and FASoft n-Track Studio. Please download Sample Farm Free, a simple version of Sample Farm Lite. Please note, however, that the sounds included in Sample Farm Free are not included in the commercial version. 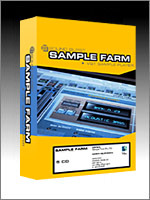 Sample Farm Free is intended for demonstration purposes only and supporting just 4 notes of polyphony (instead of 64 for Sample Farm Lite and 128 for Sample Farm Pro) and limits the ability to import external SoundFont compatible patches to files no bigger than 1 MB (unlimited ability in Sample Farm Lite and Pro). Just listen to the MP3 files below. They'll give you a taste of what this product can do for you. If you want even more power, then check out Sample Farm Pro.